You have been asked to review a 50 year-old man who has just been placed on VV-ECMO for necrotizing pneumonia. The bedside nurse is concerned that there is something wrong with the chest drain. Q1. What does this chest drain show? There is an air leak present in inspiration and expiration. 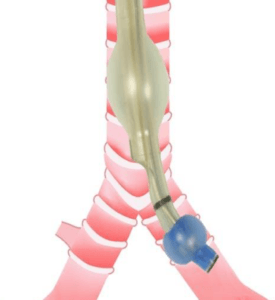 A continuous air leak in an underwater seal chest drain is usually a “system leak” outside of the patient – often at the connection between the chest tube and the collecting system. Q2. How can you diagnose a system leak? Briefly clamp the tubing proximal (closer to the patient) to the connection. If the leak continues there is a break in collecting system somewhere, if stops there is an ongoing air leak inside the chest. This is a diagnostic test only and the clamp should only remain on for a few seconds – as if there truly is a large bronchopleural fistula causing the continuous bubbling, a tension pneumothorax will quickly ensue! You clamp the drain just as it exits the patient’s chest and the leak stops! You quickly unclamp the drain, having made a diagnosis and perform a procedure to try to treat it. Q3. Describe the findings on this chest xray. 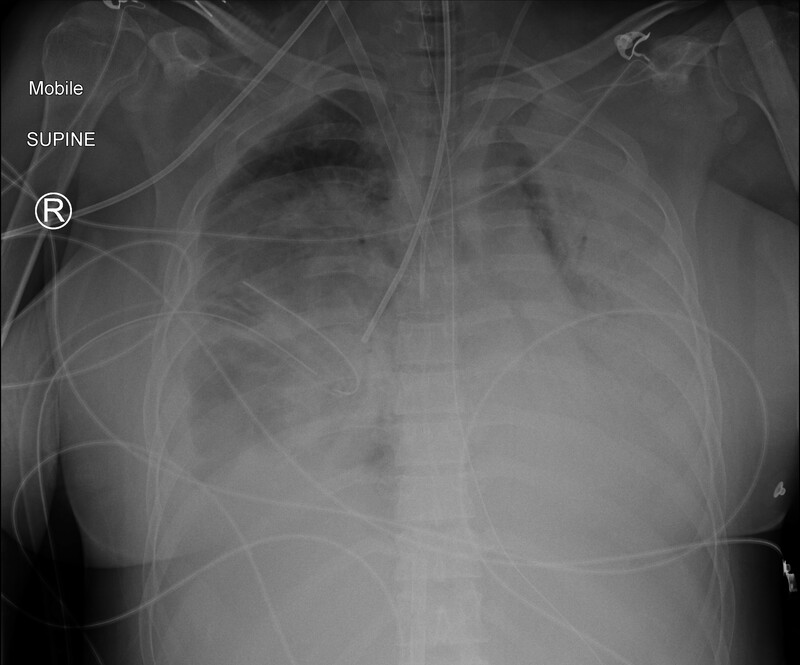 Complete white out of left lung field with air bronchograms suggestive of consolidation. Diffuse consolidation of right lung field as well with relative sparing of right upper lobe. Cardiac silhouette not visible. There is displacement of the mediastinum toward the left. Hardware includes right internal jugular ECMO cannula, endotracheal tube, NG tube, left internal jugular vein central line, right sided intercostal catheter and bronchial blocker in right main bronchus. Q4. What is a bronchial blocker and how does it work? 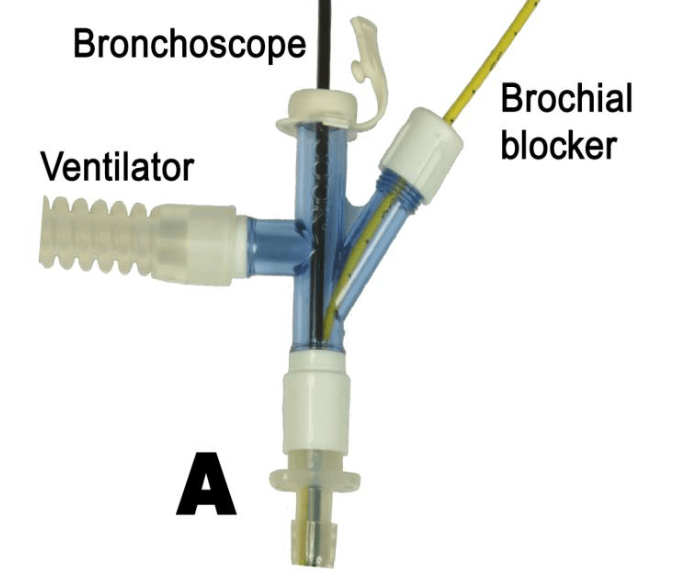 The Bronchial Blocker looks like a small foley catheter, and is inserted into the affected lung with bronchoscopic guidance if possible (blind insertion is possible though by rotating the tip clockwise or anticlockwise in an effort to direct it into the appropriate lung). Once in position the balloon is inflated, thereby isolating the lung. A special 4 way adaptor that comes with the bronchial blocker allows you to insert the blocker, use the bronchoscope and ventilate all at the same time. You’re not having much luck with the bronchial blocker so you decide to try something else. Q5. What does the Chest X-Ray show? A left sided double lumen endotracheal tube has been placed with the bronchial lumen situated in the left main bronchus. There is marked improvement in aeration on the left side. There is now dense consolidation of the right lung with mediastinal shift to the right. The Right internal jugular ECMO cannula, Left internal mutual CVC, Right intercostal drain and Nasogastric tube remain in situ and appropriately positioned. Q6. How does a double lumen tube work? A double lumen tube is an endobronchial tube that contains a tracheal and endobronchial cuff. Generally left sided endobronchial tubes are used, to avoid occluding right upper lobe bronchus. 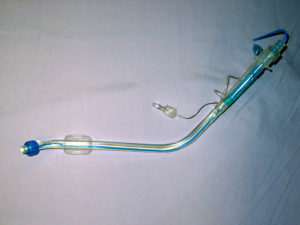 Double lumen tubes allow independent lung ventilation by having two lumens which can be connected to a clampable Y-piece. 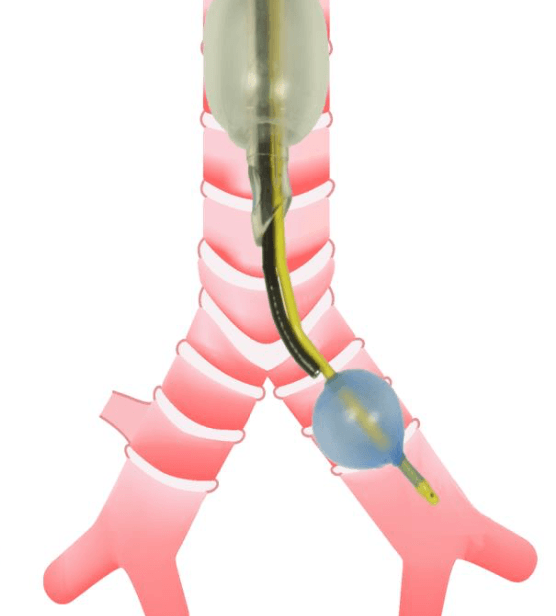 Clamping the y piece connected to the endobronchial lumen prevents air entry to that lung but allows deflation through the other lumen. Q7. What is a bronchopleural fistula and what causes it? It is an abnormal communication between the bronchial tree and pleural space. It is suspected when an air leak persists in a chest drain for more than 24 hours. 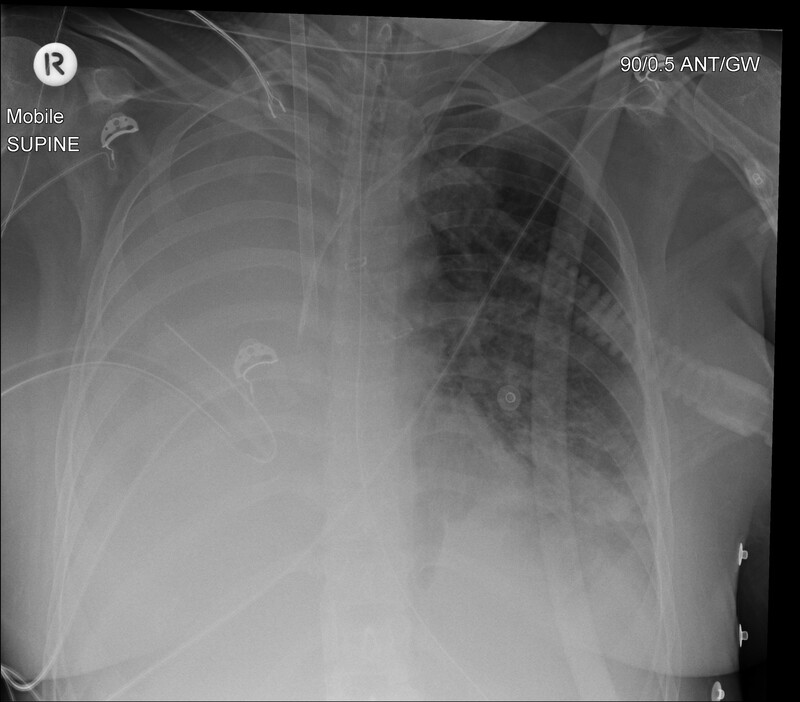 In contrast, a small pneumothorax due to alveolar disruption may produce an air leak which promptly resolves with chest tube suction. Severity of air leak due to bronchopleural fistula can be limited to the inspiratory phase only, or extend to both phases of ventilation with a detectable difference in tidal volumes. Spontaneous from underlying disease – obstructive airways disease, interstitial lung disease, ARDS. Q8. What strategies can prevent/manage bronchopleural fistulas? A protective lung ventilation strategy minimises volutrauma/barotrauma and prevents air leak. Severe air leaks can potentially impair gas exchange (A large proportion of the minute volume can disappear out the chest tube!) so monitoring PaCO2 is important. Management of established bronchopleural fistula involves minimizing further leak and allowing the fistula to close. Often bronchopleural fistula will resolve with treatment of the underlying disease. Low tidal volumes and cautiously applying PEEP is helpful. Furthermore, decreasing the I:E ratio will reduce any auto-PEEP generated by the patient. 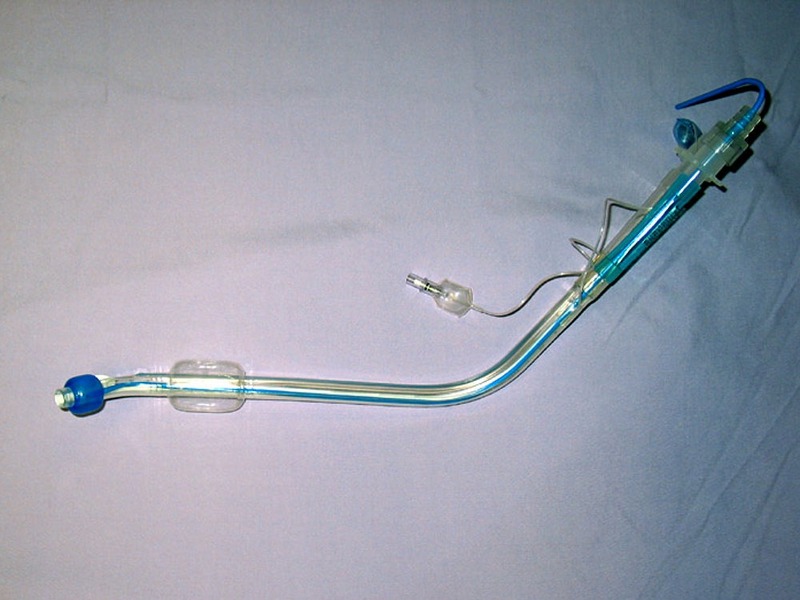 Isolating the lung with a bronchial blocker or double lumen tube can be used while the non-affected lung is ventilated. Other strategies include catheter directed balloon occlusion of the leak, coagulation with bronchoscopic laser and insertion of endobronchial one-way valve. A helpful post-publication peer reviewer pointed out that whenever you clamp a chest drain that is bubbling you should be very wary about worsening a pneumothorax. The case has been edited to highlight that the drain should only ever be clamped briefly, as part of a diagnostic test.